Game Dev Story is a genuine classic. 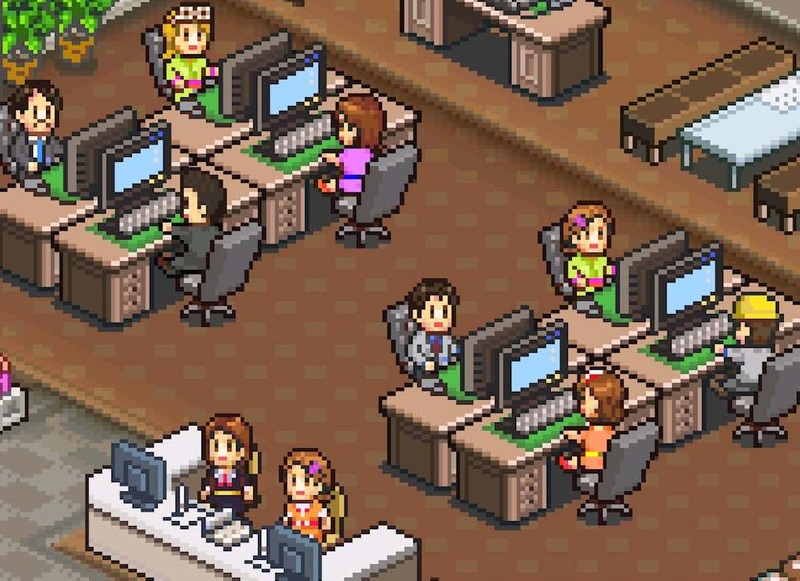 Originally a humble little iPhone title, featuring a cute sense of humour and colourful characters, it really was the title that launched its developer, Kairosoft, into the stratosphere, and has since led to dozens of other casual simulation titles. I've played Game Dev Story a few dozen times over the years on my iPhone, and so I was always going to jump at the opportunity to have it on my Switch too. It's worth noting that while Game Dev Story is a very casual little simulator, and very cute with those character names and pixel art, it does (perhaps inadvertently) highlight all kinds of issues about the games industry. The goal of Game Dev Story is, as the name suggests, to build a game development studio, from a tiny operation out of a home, through to a major company that hires plenty of people. 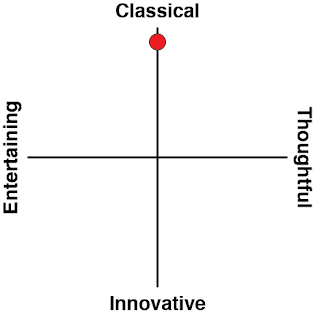 The first issue is that with every game that your company produces, you're given "review scores" by a panel of critics. It's almost impossible to get good scores when your company is small, and without spending big dollars on the production of the game. The real games industry is much the same. It's rare for a "niche" or "indie" title to gain mainstream acceptance, much less major game awards. Meanwhile, the big budget productions just about have their scores set in stone from the opening trailer, and woe be to the brave critic that stands out from their peers there. 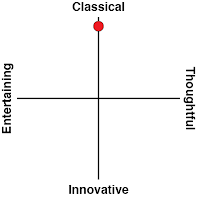 In Game Dev Story those review scores are meant to be a funny little gimmick more than anything else, but they also highlight a superficiality to the criticism and development process in which scale and investment are ultimately more important than what a studio produces. When you set your team to create a new game in Game Dev Story, you're also asked to choose a "genre" (action, RPG, puzzle, sports etc) and "type" (historical, ninja, marathon, robot, pirate etc). You always want to choose a genre and type that "match" together. So an action ninja title, rather than a puzzle marathon game. Picking genres and types that match help boost sales, and your team's skill in making those titles, so the next attempt will be even better right from the start. This seems logical enough, but only goes to highlight the way the real games industry doesn't exactly reward experimentation. Yes, sometimes a "weird" game with come together and enjoy a degree of success, but for the most part, developers feel a great deal of pressure to work within safe genres for audiences that like the familiar. There's no room in Game Dev Story to be a quirky indie developer that churns out unique ideas, because over time new consoles get released to market and the licensing costs grow in kind, so the only way to keep up is to aim for mainstream success, and that means playing it "safe." Whether deliberate or not, Game Dev Story is the most delicious roasting of the entire structure of the video game industry. As a game itself, Game Dev Story is super-casual, and superbly charming. You select the game genre and type that you're looking to make, and then select who on your team will write the scenario, develop the graphics, and create the sound. If you want, you can also hire outsiders to do this - useful if you want to give your team a break so they don't become overburdened and lose their creativity, but an expensive way to do things. Then you watch as your team works over a couple of in-game weeks. Once the game is finished, it's time to give it a name, ship it off to the critics, and then watch and see how the game performs in the charts. Get a really good review score and you'll be able to create a sequel to that game, which benefits from having a baseline level of development before production starts. In other words, once you've had that first hit, there's very little point to make new games when you can churn sequels out that are all-but guaranteed to turn out better (and review better) - another extremely on-point comment about the real-world games industry. And once you start producing really, really good games, you can start winning prizes for "Game of the Year", which comes with a cash prize. Game Dev Story is balanced so that it's almost impossible to "lose", and that's fine. It's designed to be an entertaining and relaxing bit of semi-satirical gameplay, and it works a charm for that. Unfortunately, the Nintendo Switch port is less than ideal. It looks fine on the stretched out screen (with the iPhone you played in portrait, not landscape), but as a result of resolution changes, whenever text pops up, it has a habit of being broken up quite badly in the dialogue box. 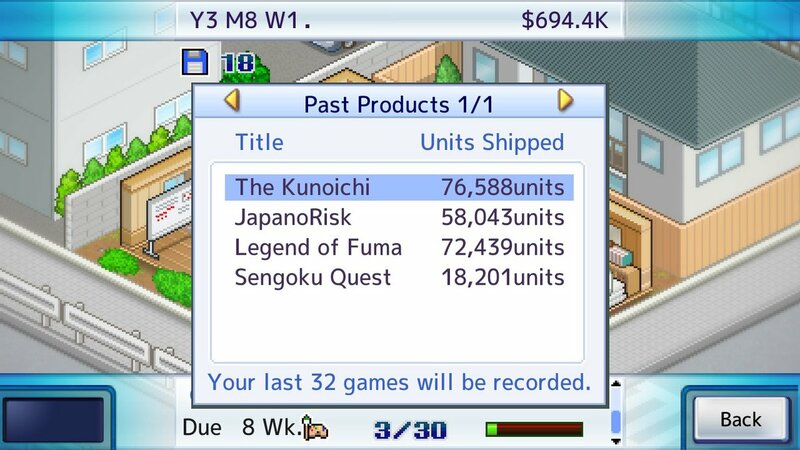 It's not game-breaking, but it's irritating, and a really lazy oversight on the part of Kairosoft. I pull out Game Dev Story every few months to play obsessively for a week or so and then, having built a magnificent empire dedicated to Japanese history games (yes, in my dreams I run Koei Tecmo), I put it down, satisfied that I'm clearly ready to take the helm at a studio when I get the call to. It's neither a game to "win" nor play endlessly, but it's one you'll certainly be glad to have on your console.